DSM Agency is extremely thankful to have had Alicia Ramirez as the 2013 summer intern. We wish her much success wherever her journey takes her. My internship at DSM Agency taught me that working at a literary agency goes beyond reading submissions. I learned how to sell a book for the best possible terms and establish a great relationship with an author. Doris and Pauline were incredibly supportive and went beyond their way to provide me with resources so that I could make the most out of my experience. They invited me to events for agents, which have made me a well-rounded intern. Thanks to their mentorship, I now have a solid foundation that will help me blossom into a publishing professional in the near future. For more intern testimonials, click here. Marty Schmidt (beloved brother of Doris) worked and played in the mountains of the world…but they conspired against him. 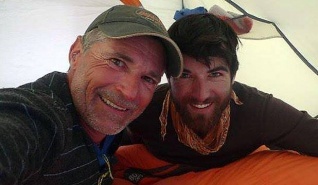 In the dead of night as he slept perched high on a ledge on K2 an avalanche struck sweeping Marty and his son Denali to their death. As she deals with her grief Marty’s daughter and Denali’s sister says she could not have written a more poetic ending for her passionate mountaineer father.